Update 2016-12-23: graphs from water.weather.gov. Update 2016-05-31: See sea level gage reports. Update 2015-04-28: Added flood stages and tentative highest safe and lowest boatable water levels, both above the charts for each gauge and in a summary table. If you have data, please let us know. 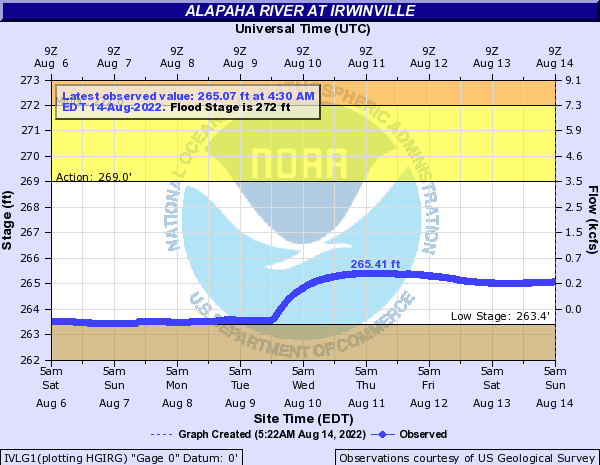 Here are water level gauges for the Alapaha River in Georgia and Florida, north to south. The graphs should show the current levels at this time, in feet, plus for most of the gauges a bar graph of selected historic levels. This is a draft of a concept for use with the Alapaha River Water Trail. 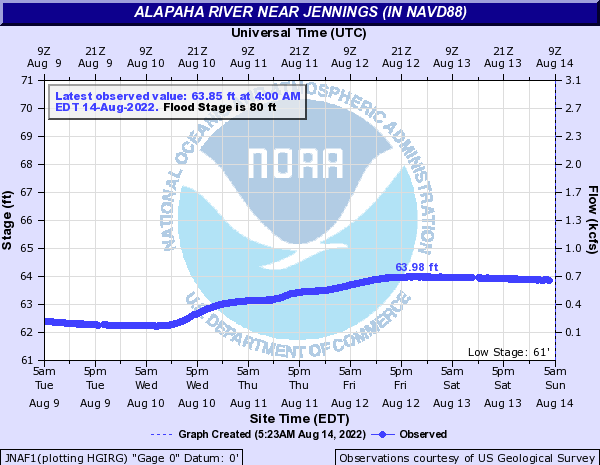 See also Alapaha River Rainy Season. It is also a companion to the similar set of graphs for the Withlacoochee and Little Rivers. 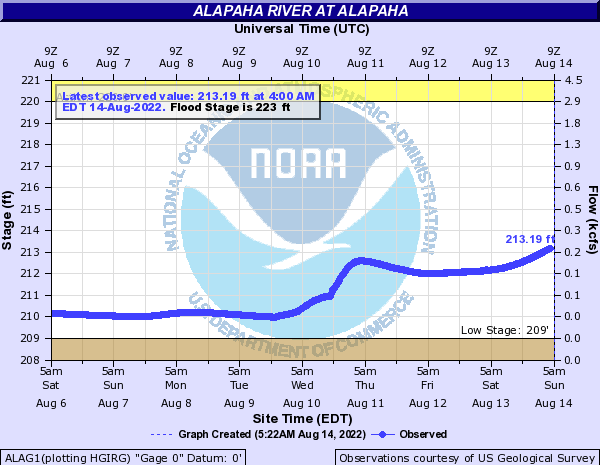 See below for the current Alapaha River water level graphs. Update 2014-11-04: Simplified gauge formatting. See the levels for each gauge below, which are taken from the ARWT spreadsheet. Highest safe 5.9 feet, 268 NAVD. Lowest boatable 1.8 feet, 263.9 NAVD. Highest safe 10.6 feet, 218.2 NAVD. Lowest boatable 7.7 feet, 215.3 NAVD. Highest safe 6.0 feet, 82.1 NAVD. Lowest boatable 2.0 feet, 78.1 NAVD. Highest safe 7.4 feet, 68 NAVD. Lowest boatable 4.4 feet, 65 NAVD. 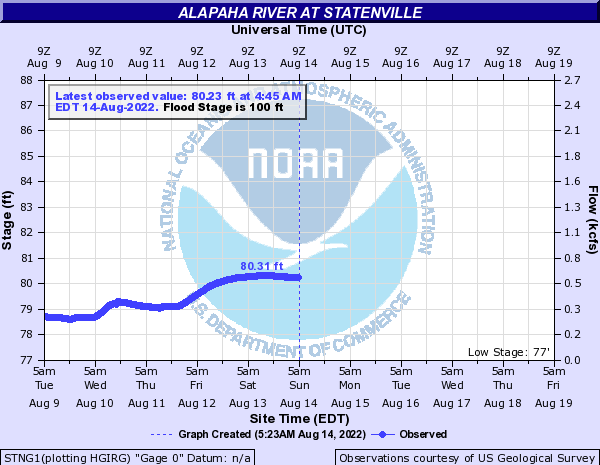 South Atlantic Water Science Center – Georgia: Alapaha watershed FloodTracking. USGS Streamflow for Georgia and Florida. This entry was posted in Blueway, Quantity and tagged Alapaha River, Berrien County, conservation, Echols County, Florida, Georgia, Hamilton County, Irwin County, John S. Quarterman, level, Lowndes County, north Florida, Quantity, river, south Georgia, SRWMD, Suwannee River Water Management District, United States Geological Survey, USGS, watershed, WWALS, WWALS Watershed Coalition on November 3, 2014 by jsq.